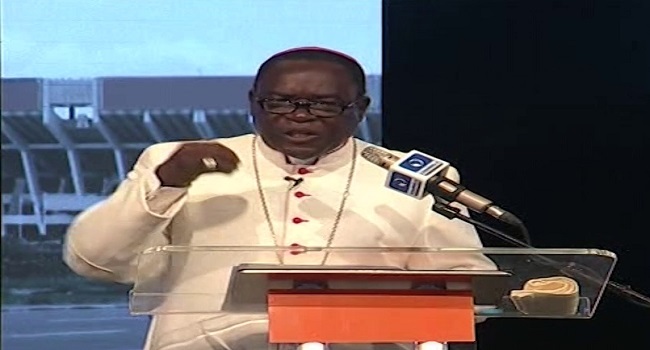 The Catholic Bishop of Sokoto Diocese, Mathew Kukah, has challenged Nigerian youths to work together in tackling the security challenges facing the country. Bishop Kukah made this call on Saturday in Abuja, Nigeria’s capital. “Young children, please remember that in Plateau State, only last week, there were perhaps many young children like you getting ready and preparing for graduation but now they have graduated to the grave,” he said. Beyond the attacks in which at least 100 people were killed in Plateau last weekend, the renowned cleric also decried killings that have claimed many lives in Benue, Zamfara, Kaduna, Katsina and other states. As the government and security officials work to find solutions to the killings that have continued to defy efforts made so far, the bishop said parents share some of the blame in the security challenges. He, therefore, wants parents to better perform their roles of seeing to the welfare of their children, especially giving education to the girl-child. “Too many parents are outsourcing parenting. We have transferred our responsibility to machines. Our society is not going to grow if we don’t give our women a voice,” he said. Kukah’s comments a week after suspected herdsmen attacked Xlands, Gindin Akwati, Ruku, Nhgar, Kura Falls and Kakuruk in Gashish district, Barkin Ladi Local Government Area of Plateau State. During the attack, 100 people were confirmed killed, six people were injured while at least 50 houses, two vehicles and 15 motorcycles were burnt. The attack has been widely condemned by the President, state governors, lawmakers and various groups, including Christian Association of Nigeria (CAN) which urged the government to review the nation’s security architecture. President Muhammadu Buhari, Vice President Yemi Osinbajo, the Nigerian Governors Forum and former President Olusegun Obasanjo are among those who have paid condolence visits to the state. In reaction to the killings, many Nigerians and groups have criticised efforts so far made to halt the bloodshed called on the government to take more drastic and decisive action. Among those, who condemned the continued killings was Nobel laureate Professor Wole Soyinka who warned in a five-page statement that “The Nation Is Dying” as things stand and urged the President to speak a language that “murderous herdsmen” understand.